Sprint today announced launch details regarding the LG G4 smartphone, which will be available in stores and online beginning June 5. Sprint is offering a wide range of purchasing options for the phone. First, via the Sprint Lease the G4 will be available for $0 followed by $18 per month for 24 months. At the end of the lease, customers can turn the G4 in for another handset, or buyout the remaining value of the lease. Alternately, customers can use Sprint Easy Pay to finance the device over 24 months. Sprint Easy Pay doesn't require a down payment, but costs $25 per month for 24 months. Sprint will also sell the G4 for $199.99 with a standard two-year contract, or for the full retail price of $599.99 without a contract. Sprint plans to offer the plastic gray back plate or the black leather back plate. The phone has a 5.5-inch quad HD screen, Snapdragon 808 processor, and a 16-megapixel camera. Customers who preorder may receive a second 3,000mAh battery with charging cradle and a 32GB memory card for free. Preorders begin today. LG's flagship for 2015 is a tricky device to classify. It both lags and surpasses the competition. 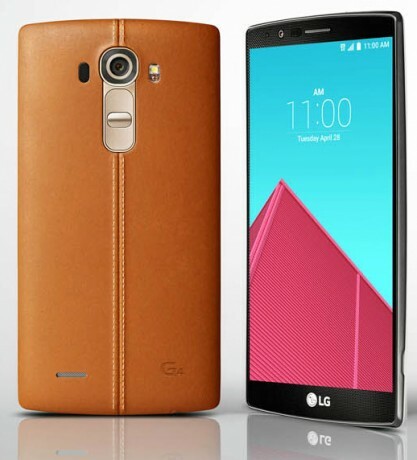 LG today announced the G4, its 2015 flagship smartphone. The G4 is skinned in "vegetable-tanned" leather in a bid to set the phone apart from competing designs from Apple, HTC, and Samsung.